Once upon a time storage was a big problem but the innovations in technology have solved this. We can say that Cloud computing is one of the most significant breakthroughs in the technological world. And Salesforce is one among those cloud computing technologies which has brought drastic changes in the world of business. In this Salesforce Tutorial, we are going to cover all the topics associated with salesforce concepts, how it all began? Where is it being used? What caused it to be all-time hit? Etc. It would act as a guide for beginners, admin, and developers, who wish to build their career in futuristic technology known as Salesforce. Salesforce is the world's number one cloud-based Customer Relationship Management platform (CRM). It is very strongly equipped with the different business segments such as sales, service, marketing, etc., to support the customer round the clock. It requires no IT professionals to set up or to manage. It enables organizations to engage with customers in a whole different way. How to create a dashboard in Salesforce? 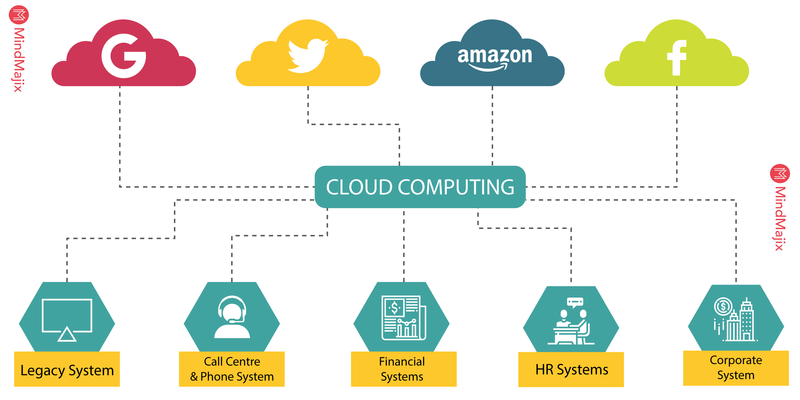 Cloud computing is the delivery of computational services such as storage, servers, database, software, networking, analytics, intelligence and more over the cloud (internet). It brings the organization faster innovation, economies of scale, and flexibility in allocating resources. Cloud computation brings down the costs that are associated with the task of storage and thereby contribute to the development of an organization. Migrating from the traditional storage system to cloud will land you in a place where you will avail plenty of benefits such as Cost-effectiveness, Speed, productivity, performance, Global scale, and security. There are three different types of cloud computing services available, which are a public, private and hybrid cloud. Let's look into each. It has been provided by the third party vendors such as Salesforce Amazon web services, Microsoft Azure, etc. The third party vendors maintain everything such as servers, storage, hardware, software. Via web browser you can access and manage your services. it’s a cloud computing service exclusively used by a single organization. Private cloud is defined as a privately owned network which contains services and infrastructure required to manage cloud computing services. It’s a combination of public cloud and private cloud and allows them to share data and applications among them. Hybrid cloud will enable your business with more deployment options, greater flexibility and also allow you to optimise your business infrastructure, compliance and security. Broadly we have three cloud computing services which are IaaS, PaaS, Serverless, and these are built one upon another. Having explicit knowledge on these different layers would be helpful for you to have a precise knowledge on cloud computing technology. It is a rental type cloud computing infrastructure which includes Server and virtual machine, networks, storage, operating systems, facilitated by a cloud provider. It’s a cloud computing on-demand environment for designing, developing, testing, delivering and maintaining different applications. It is intended to create a user-friendly platform where a developer can quickly build web and mobile apps without worrying about the software infrastructure. Serverless computing is a method of providing backend services paid on a usage basis. It allows users to write and deploy code hustle free without depending on underlying infrastructure. Although it is called as serverless cloud computing physical servers are still exist in the process, but the developers need not be familiar with them. In this section let’s discuss why salesforce became popular and why it is the best cloud computing platform to choose. 1) Salesforce is equipped with a wide variety of tools, and you can have a facility here to develop whatever you want rather than wasting time on building Infrastructure and tools on your own, this could help in saving millions of dollars and years as well. It is straightforward and quick enough to deploy when compared to traditional CRM. Traditional CRM platform takes weeks, months, and even sometimes years to implement. Salesforce is very easy and simple to use; it makes the complicated process simple and into user understandable format. Salesforce is highly flexible and easy to customise according to the needs of an organization. It is perfect and effective to meet the business requirements. 3. Salesforce is operated from the cloud, so it enables your employees to work from anywhere in the world all they need is an internet connection. 4. Salesforce will allow you to connect with different other 3rd party apps seamlessly. It will enable you to integrate with many other apps compared to other CRMs. 5. Salesforce is cost effective and affordable by all types of organizations irrespective of mode of operation or size. Salesforce CRM is power packed with different cloud products that help in fulfilling all your business needs. Let's consider one by one and get to know how could they assist us in meeting specific requirements. Sales could is one of the modules in salesforce in which entire sales process is being executed, and revenues are generated. It helps organizations in negotiating the deals faster, managing the customer, closing the deals. It presents the entire sales data with this; you can take insights that help in making data-driven decisions. Salesforce cloud enables organizations in managing the tasks such as contact management, opportunity management, Lead management, Sales collaboration, Email integration, territory management, file sync and share, etc.. are the tasks managed by the Salesforce sales cloud. Service cloud will take care of the tasks which are related to customer service and support team. It manages customer-related services such as call center, knowledge base, live conversations, assistance with products to customers. The primary motive behind the service cloud is to keep people satisfied with the products and services purchased from an organization. Salesforce service cloud has equipped with services like Lightning console, live messaging, Omni routing, field service lightning, service wave analytic's, social customer service, etc. All these features are meant for delivering the after sale services to keep a customer happy and to generate referrals from them. Salesforce marketing cloud helps in navigating a customer journey on a single platform. It provides insights into the marketing conditions and supports the marketing team in delivering the right messages to the right customer at the right time. It automates marketing tasks and creates marketing campaigns to drive user engagement. It enhances the new customer acquisition, gives us the data of inactive customers and helps in converting them to active customers through different strategies. Salesforce marketing cloud helps in creating landing pages, increasing conversations, etc. Salesforce commerce cloud creates a better customer experience for the customers. It creates a space for customer data integration so that it generates personalized feeds to engage the customers. Salesforce commerce cloud accelerates the online presence of the business and helps in creating revenue from the digital world. We can quickly build an efficient and responsive front end design with the help of commerce cloud. It manages the online related activities such as, campaigns content management, product pricing, and catalog management etc. there are multiple extensions available in the Salesforce cloud which improves the functionality of your website. If you want to engage with your customers, employees, and partners, then there is a requirement for the social platform to pass the information on a timely basis. Salesforce community cloud will fulfil this gap and facilitates a great platform for effective communication. Customers, partners, and the people whoever associated with the product or service can come together to a place where solutions are provided for different problems. It creates a freedom place to share everyone's insights and product ideas. Community cloud helps in finding solutions for problems. Salesforce analytics cloud is also called as Salesforce wave analytics, which is a business intelligence tool optimized for mobile access and to present the large volumes of data into user understandable format. This platform is very active and straightforward to use. The user can get into the critical areas of the data with a few clicks, and it requires little or no training in data analytics. Analytics cloud is designed to integrate with all other platforms of salesforce such as sales cloud, marketing cloud, service cloud, to access data from all these platforms to perform analytics. If your organization needs to store and process the Internet of Things (IoT) data, then you need an effective cloud platform. Salesforce is one of the powerful cloud IoT platforms to store the massive amounts of data that is continuously generated by different devices, such as applications, websites, sensors, patterns and customers. If you are into Health IT organization and need to manage the health-related data such as patient prescription, health records, doctor-patient relationship data, then you probably in need of salesforce health cloud which will take care of everything. It is specially designed to store and organize the patient information to provide the best health assistance. Chatter is an enterprise collaboration platform from Salesforce, and it works similar to the intranet of an organization. It works as a private directory of an organization, in which each employee allocated with a profile page that contains his profile pic and details such as, the role of the employee, whom he has to report, the location of the employee, and contact details etc. Chatter works similar to Facebook and Linkedin where users can connect to share the common information and to share their views on different issues. Here employees are allowed to “follow” documents and people to identify the opportunities, campaigns, service cases, projects, and tasks. Salesforce one is an essential tool from Salesforce, which enables the Salesforce platform to develop application development and data exchange with the help of Application User Interfaces (API’s), and prebuilt programming code components. It was launched in November 2013, with an approach called “mobile first” application development. This main application motive is to develop the application for Web first, desktop second, and an Open architecture that enables to integrate and work with different third-party applications. Salesforce1 allows building applications on a customer success platform, in association with Lightning development platform. This combination allows third-party building applications on top of the salesforce. As we know a lot of companies out, there are moving towards the implementation of CRM technology in their organizations to lead their businesses. Salesforce is the popular CRM tool widely used by the organizations because it possesses the features that every organization envision of. Let's discuss some important features to know why Salesforce is a futuristic one. Google made an alliance with Salesforce in November 2017, and it was one of the renowned partnership in the cloud computing segment. This alliance made salesforce stronger than before, and it has a chance to utilise the google core services for its futuristic expansion. Gartner predicted that the extensive adoption of Software as a Service (Saas) had made the roots for the popularity of CRM adoption. According to Gartner deployment rate of Saas will be increased to 80 to 85% by 2025. It shows how CRM is going to play a significant role in future. The demand for salesforce applications has been growing exponentially. In the long run, we can expect the integration of big data and data science with salesforce to satisfy the future needs of the organizations. Now Salesforce is holding the significant market share in the CRM industry. We all know that salesforce frequently come up with the industry demanded features that made it be an active player in the CRM segment. Its flexibility and easy to adoption feature always keeping it on the top of the market. Many organizations across the world are switching to salesforce to sustain in the highly competitive world as the demand for the delivery of services increases, and the same way demand for the developers increases as well. Automatically the pay scale would be high relative to the demand. Salesforce CRM capabilities with sales cloud is making it an industry player, and hence the job roles in this segment have been increasing. There are 2,00,000 plus organizations across the world are using the Salesforce1 platform to leverage various business functions. Hence there is a massive demand for the certified salesforce job roles who can find the innovative way to make their business reach the new levels. There are close to 2000 companies which are developed on top of the salesforce1 platform. Hence there is an increased demand for the people who can build better applications to enhance CRM capabilities. Till now we have been discussing how Salesforce is playing an essential role in the CRM industry. Continuous learning and developing skill will give you a better position in your field. Salesforce Certification will play an important role in uplifting the career of a person. To get a certification in Salesforce, you need to have a strong knowledge in the particular domain that you are working in. A certified employee is treated as an expert and demanded by the employers to work for their company. Your knowledge is reflected by the no of certifications that you hold in any field, and the same thing applies here in salesforce. Whether you are a Salesforce Administrator, Force.com Developer, an Implementation expert or an architect, the salesforce certification adds value to your profile. You might be wondering what are different types of certifications and at what point one should opt for it. To put an end to all your doubts let's discuss the things below. Salesforce Certifications are designed based on industry standards; to qualify these exams would be a bit difficult but possible. There are various types of Salesforce Certifications, and each one is specifically designed for different levels of salesforce roles. One should require appropriate certificates at different levels of their salesforce career. Implementation Experts or Consultant Certification. Let’s discuss each job role in detail to have clarity. A developer is a salesforce professional who is having a skill set to develop the cloud-based applications through force.com platform. To perform salesforce developer role one should know about the complete salesforce and its limitations. Salesforce administrator has to perform the full range of tasks such as maintaining data quality, helping users to develop reports, adding fields, running backups among different people, unlocking or resetting passwords, adding new whitelisted IP addresses, and lot more others. A salesforce architect job role demands complete knowledge on web services, salesforce knowledge, and also one should possess knowledge on various programming languages, etc. Salesforce consult is business savvy and adds value to the business. One has to be good at communication and people management skills to take up this role. People who ever wish to perform this role has to be good at technical and functionalities of the Salesforce platform. His role includes adding value to the business by bringing the clients and ensuring their satisfaction. The demand for the salesforce project manager has been growing due to an increasing number of industries of salesforce. The project manager should possess complete knowledge on cloud computing, application of a cloud computing of a business, and expert knowledge in Salesforce. His/her job roles include interaction with various departments on different customer projects to complete them on a timely basis. The role of a Business analyst includes identifying business requirements and developing a solution with the help of the Salesforce platform. These people also responsible for analyses the run environment and implementation process of salesforce in an organization. We have covered all the essential elements which are associated with the Salesforce platform. Either professionals or students whoever wants to build their career in Salesforce it is advisable to opt for formal training. Sharpening one’s skills continuously would helpful in enhancing their career in salesforce. I hope this tutorial has helped you in educating on various salesforce topics! Happy learning!